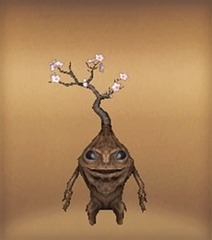 A Mandragora with foreign flowers starting to blossom. When it is flowering season, it needs to be given plenty of water. and the tree needs to be pruned in order for it fully blossom. The Mandragora flowers' scent can soothe and calm the hearts of those around it.